By 1860, Vermont was a solidly Republican state, as the majority of its citizens gave their political allegiance to the party that sought strong limits on the spread of slavery. Nevertheless, a few hardy Democrats–including the editors of the Burlington Weekly Sentinel–spoke out for their candidate, Illinois Senator Stephen A. Douglas. 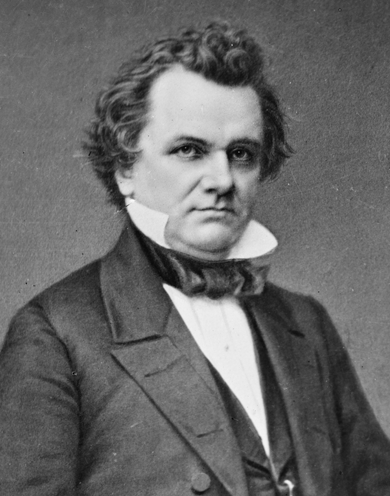 Illinois Senator Stephen A. Douglas, Northern Democratic candidate for president in 1860, was born and raised in Vermont. Born in Brandon, Vermont, in 1813, Douglas moved west at the age of twenty andsoon established himself as a lawyer in Illinois. Douglas admired Democratic president Andrew Jackson, and quickly rose through the political ranks of Illinois’ Democratic Party, winning election to the United States Senate in 1847. Stephen A. Douglas is best known for the series of debates he held with Abraham Lincoln when Lincoln ran unsuccessfully against him for the Senate in 1858. Those widely reported debates helped propel Lincoln to the presidency in 1860. In the days leading up to the election on November 6, 1860, the outcome was very much in doubt. Voters in the South virulently opposed Lincoln and the Republicans, whom they considered abolitionists and opponents of states’ rights, but slavery and its associated issues had split the Democratic Party into northern and southern camps. Douglas faced not only Abraham Lincoln, but John C. Breckinridge, the candidate of Southern Democrats, and John Bell, candidate of the Constitutional Union party, whose members were disaffected by both Democratic candidates. In the face of Vermont’s overwhelming support for the Republican Party, the Burlington Weekly Sentinel exhorted Douglas Democrats–collectively labeled “the Democracy”–to do their duty and vote for Stephen Douglas, despite the discouraging odds. Douglas would win a little more than 19% of Vermont’s popular vote while Lincoln won more than 75%. Lincoln’s national plurality of about 40% of the popular vote was not enough to provide even an illusion of national unity, but he easily won more Electoral College votes than his three opponents combined. Vermont Democrats would have to wait 104 years, with the election of Lyndon Johnson, before their party won the statewide vote for the presidency.